In a major move that creates great storytelling opportunities for brands, Facebook is rolling out 360 degree and panoramic photos for the News Feed. This will allow allow users to view and upload pictures taken with 360-degree cameras on both desktop and mobile. Most people don't have a 360-degree camera yet, but you don't need to rush out and get one. Most 360 degree photos will for now probably come from panoramic shots taken with Samsung Galaxy and iPhones. There are also 360-degree photo apps like Google's Photo Sphere, which allow you to easily take 360 photos with your current phones. You upload a 360 photo to Facebook just like any other photo. Simply tap "Photo/Video" above the "What's on your mind?" box and select the 360 or Panoramic photo you want to upload. They'll appear on the News Feed just like any normal photo but with a small compass icon in the corner, signifying that you can explore the photo further. Just as with 360 videos hosted on Facebook, desktop users can click and drag 360 photos to see different parts of the photo while mobile users can swipe the photos or tilt their phones. 360 photos give you the ability to take the stage in front of 100,000 fans with Paul McCartney, get behind-the-scenes access to the Supreme Court via The New York Times, visit the International Space Station with NASA, and more. This medium enables new opportunities for creativity, and we’re excited to see what kinds of 360 photos get shared on Facebook." As a brand, this is quite an interesting opportunity. From events, to launches, these create a sense of panoramic storytelling. Even simple product features can now have a wow effect. Fashion brands should find this a great way to tell their stories, It's limited simply by a social story teller's imagination. 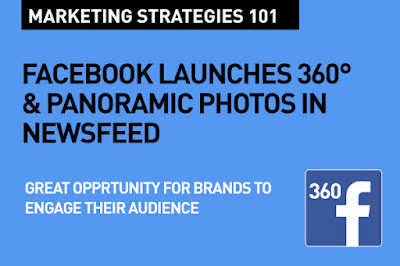 Make sure you know what kind of 360 or panoramic content will resonate with your audience. What will engage. As always, start with: Customer Insights is your First Step in Digital Marketing. Remember, that you are aiming to create engaging content – it's not really about advertising your brand or product. Read more on Advertising vs Engagement. How to win the battle for today's Always On consumer. This is a big step for Facebook, but it's the proverbial giant leap made possible for brands. And that's the basics. That's Digital Marketing Strategies 101. How to use Facebook Live video like a pro. The essentials of getting it right. Facebook are constantly competing with Google and YouTube, and this one really gives it a bonus point. It's nice that the new feature is not just for real 36o degree photos, but also allows for panoramic shots. That makes it easier for us all to post content on the News Feed that is interesting. Samsung and iPhones were mentioned. Does it not work with other phones (Android)? Cannot get this to work on my iPhone for some reason. Is this only for brands?